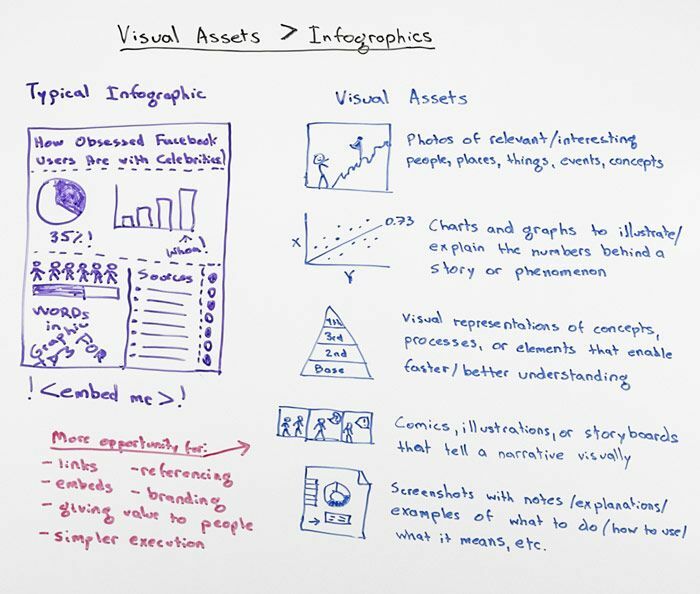 ABCInternetBizz.com | Infographics Or Just Graphics?Infographics Or Just Graphics? The use of Visual Aids to support and amplify a message has always been powerful and the more appropriate the VA the better. In recent tests made since Google’s Hummingbird update of over 10K key words and 300,000 searches, the evidence continues to suggests that pictures will hold your audience for longer, leading to lower bounce rates. People like pictures. And if those pictures are correctly embedded they are going to help you being searched by the darling Google bots. If we’re asking the question, Why spend the time making this form of visual asset? – and if the answer is only to “get embeds, links, traffic and branding” and not to help your reader, then the more cynical reader would be put off. The graphic would work against you and appear superficial. I was very comforted by Rand Fishkin’s list of Visual Assets and how he’s seen them being used virally. And of course, let’s not forget the whiteboard itself, is a visual asset – an extremely useful one you can modify as your message move along. I guess I’m a very visual learner. I do like Infographics – not all, admittedly, but most. They do hold my attention and, when well constructed, lead me through a story of information. I think they should direct you though a stream of facts to help your understand something in greater detail or to help you reflect on a concept with greater clarity. It’s like reading lots of facts without the pain of deciphering the structure of difficult sentences! And that’s why they’ve been so contagious, because so many of us are visually lead. His argument is mainly against badly constructed infographics, or those with a facile subject with no worth. If they actually help to deconstruct a complex issues they must surely be of help to the reader. I’m not knocking the use of any of the other visual assets mentioned in the video, and like Rand, I think that infographics are just another kind asset. But lets face it, Mr Fishkin’s dislike of them could be used against any of his favoured visual assets if they were used inappropriately. I suppose, in the end, infographics will develop and become a part of the arsenal that anyone can use to get across their story or message, engage the reader and hopefully have them spread your word – graphic. Please Google+ Like or Tweet this article. « Google Sniper – What Does It Actually Do?